Please allow up to 2 weeks for standard delivery for in-stock items. There is an express delivery option available at an additional charge. Please allow up to 48 hours processing time in addition to the shipping time when choosing your shipping method. Some items are shipped directly from the vendor and may take up to 6 weeks to be delivered. These items are identified on the website. For shipments outside of the Continental U.S. or Alaska, there is an additional charge to the shipping charge. 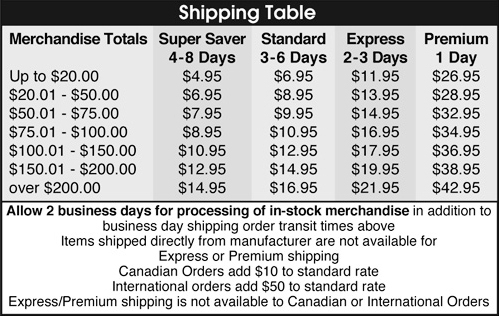 Please see our shipping table for details. The customer is responsible for international duties and taxes. These duties and taxes will be billed and collected by the carrier upon delivery. Charges are based on the value of your order.